How to apply for EFLU Entrance test 2018(Degree, PG, PhD, Teacher Training Course Admissions)/ How to apply for EFLU entrance test 2018: How to apply #EFLU Degree, PG, PhD, Teacher training programmes admissions 2018/ IFLU Entrance Test 2018 online application filling instructions/ IFLU CET 2018 step by step online applying procedure/ IFLU UG, PG Courses admissions 2018 online application form/ admissions @ efluniversity.ac.in: The English and Foreign Languages University(IFLU) has given Degree, PG Programmes admission notification and Online applications are invited for admissions to the UG, PG, Teacher training and Ph.D. programmes at English and Foreign Languages University for the academic year 2018-2019. 1. Download the Online Prospectus from the website and check the academic programmes offered and the eligibility criteria for each programme. (f) JRF certificate, if you are a JRF awardee. (i) If PhD Part Time programme is chosen, then Teaching/Experience certificate is mandatory. 1. Click on EFLU Registration online. 2. Complete the details required. Then click the SUBMIT button. 3. Enter all the relevant details carefully. Change of data will not be allowed. 4. A password will be sent from EFL University to your registered mobile number and email id. 5. Retain your User ID and Password that appear for further reference. 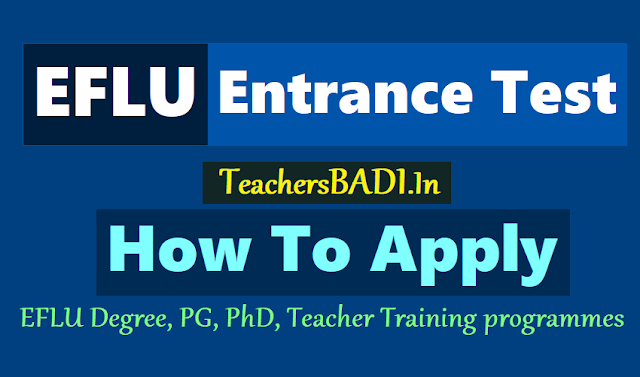 Login to with the user id and password received from EFL University. 1. Click on EFLU Registration Online to get the application form. 2. Complete the details required, upload your passport photograph, signature and certificates if any, and make the fee payment. Then click the Submit button. 3. Pay the required fees online using Net banking / Credit Card / Debit Card of any bank following the link that appears (see INSTRUCTIONS FOR PAYMENT OF ENTRANCE TEST FEE for moredetails). 4. Once the payment is made, you will receive an SMS and email confirming your payment. 1. On the date announced, (see website for information) download the Admit Pass using the same username and password. 2. You will receive a system-generated Admit Pass. Download it, keep it safe and bring it to the Test centre on the Entrance test date. While filling the online application form, you will be provided with a link to upload your photograph and the image of your signature. So before applying online you must have a scanned (digital) image ofyour photograph and signature as per the specifications given below. (i) Photograph Image: Photograph must be a recent one and should be in passport size colourpicture. Make sure that the picture is in colour, preferably with a white background. If youwear spectacles, make sure that there are no reflections and your eyes are clearly visible. Caps/hats and dark glasses are not acceptable. Religious headgear is allowed but it must notcover your face. The photograph should be in 200 x 230 pixels. Ensure that the size of thescanned image is not more than 50KB. Adjust the settings of the scanner, such as the dpiresolution, during the process of scanning. (ii) Signature Image: You have to sign on white paper with black ink/ball point pen. Scan thisimage. The signature should be in 140 x 60 pixels. Ensure that the size of the scanned image isnot more than 20KB. The signature will be appended on the Admit Pass and wherevernecessary. If your signature on the answer script, at the time of the examination, does notmatch with the signature on the Admit Pass, then you will not be allowed to write the entrancetest.  Crop the image in the scanner to the edge of the image, then use the upload editor to crop the image to the final size (50 to 150 KB, as specified in the application form).  The image file should be JPG or JPEG format. An example file name is: image 01.jpg or image 01.jpeg. You can check the image dimensions by listing the folder files or moving themouse over the file image icon.  Candidates using MS Windows/MS Office can easily obtain the image in .jpeg format not exceeding 50KB (photograph), 20KB (signature) & 200KB (Proof of BC/SC/ST/PWD/WDP and other certificates) by using MS Paint or MS Office Picture Manager. Scanned images in any format can be saved in .jpg format by using 'Save As' option in the File menu and size can be reduced below 50KB (photograph), 20KB (signature) & 200KB (Proof of Date of Birth, Proof of BC/SC/ST/PWD/WDP Certificate) byusing crop and then resize option (please see point (i) & (ii) above for the pixel size) in the 'Image' menu. Similar options are available in other photo editors also. 1. There are separate links for uploading images. 4. Browse and Select the location where the Scanned Image file has been saved. 5. Select the file by clicking on it. 6. Click the 'Upload' button. 1. Open the scanned images in MS paint. 2. Click on images--->stretch/skew (ctrl+w). 3. Reduce the horizontal and vertical percentage in the stretch box, if the image size is more. 4. Increase the horizontal and vertical percentage in the stretch box, if the image size is less. 5. Save the image in JPEG format. signature and other required documents. 1. Last date of receipt of applications: 07.02.2018.